The sporting business is big business and if you don’t have the correct supplements you may struggle to reach peak physical condition. 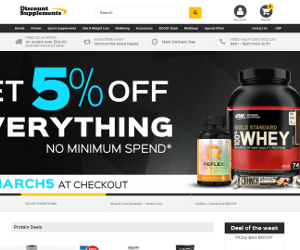 Discount Supplements proudly boasts to be the largest online sports supplement store in the UK. They sell popular protein supplement, sports supplements, diet and weight loss, wellbeing and much more. One thing to be aware of, supplement company work on economies of scale, so expect big savings when you buy more. Discount Supplements often run multibuy offers, grouping popular products together. Popular brands of supplements include Golden Standard, PHD, Optimum and hundreds more. From their humble beginnings 12 years ago on eBay to the 40 man strong store. Discount Supplements believe they can provide you the largest range of sports supplements under one roof, at competitive prices.